Rogue waves represent a very high local concentration of wave energy compared with an average of the field and occur in many nonlinear dispersive media with small probability. A number of mechanisms are known to produce such large waves from moderately smaller ones and one mostly studied mechanism is the modulational instability. Rogue waves have been observed in different physical systems e.g. optical fibres, water wave tank and plasmas. Although they appear in very different physical media, they possess strikingly similar characteristics – high amplitude, spatio-temporal localization, spectral broadening with the oceanic rogue waves. The mathematical formulation for rogue wave in hydrodynamics was first reported by D. H. Peregrine and named after him as Peregrine soliton using Nonlinear Schrodinger Equation (NLSE). Special characteristics of Peregrine soliton are that it has spatio-temporal localization and maximum amplitude amplification of three times that of the background wave. It has also been established that higher order as well as breather structures of rogue wave are possible under the frame works of NLSE. In multicomponent plasma containing a critical concentration of negative ions, the first experimental observation of ion acoustic Peregrine soliton was reported in 2011. This becomes possible because ion acoustic wave is modulationally unstable in such plasma. Super rogue wave phenomena or the second order Peregrine breather has also been observed in multicomponent plasma which has maximum amplitude amplification of five times that of the background wave. Above a threshold, multi-rogue waves are generated, and the number of rogue wave pulse is dependent on the quantum of additional energy incorporated into the initial pulse. Detail mechanism of ion acoustic rogue wave structures in laboratory plasma will be covered in the talk. DR. HEREMBA BAILUNG, Professor and Head, Physical Sciences Division, Institute of Advanced Study in Science and Technology (IASST) Guwahati completed his M. Sc. Physics from Dibrugarh University in 1986. He obtained his Ph. 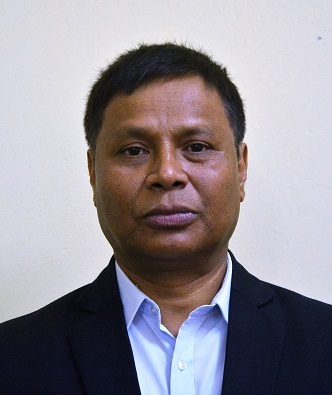 D. degree from Gauhati University in 1996 for his thesis entitled “Experimental investigation on nonlinear Ion acoustic waves in laboratory plasma” under the guidance of Prof. Joyanti Chutia. He was awarded the BOYSCAST Fellowship by Department of Science & Technology, Government of India, to carry out advance level research work in the Institute of Space and Astronautical Science (ISAS), JAPAN in 1999. He has published more than 70 research papers in international journals of repute. His research interests are: wave and instabilities, sheath induced nonlinear phenomena in multicomponent plasma, waves and dynamical structures in strongly coupled dusty plasma.